OS X 10.5 brought many changes to the networking side of the system, and for the most part, these changes are for the better. If you accidentally put a shared Mac to sleep, for instance, the machines connected to that Mac no longer experience spinning beachballs in the Finder while trying to connect to that machine. One change that’s not so good, however, is that connected shares no longer appear in the sidebar. 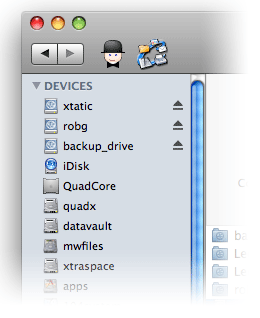 In OS X 10.4, if you connected to a Mac with a number of drives attached, when you connected to one of those drives, it would automatically show up in the sidebar. In 10.5, however, that doesn’t happen—the mounted share only shows up after you’ve clicked the machine providing the share in the Shared section of the Finder’s sidebar. If you use column view mode, each connected share shows a small eject icon to the right of its name. In all other view modes, however, you really can’t tell whether a share is mounted or not. Also, once mounted, there’s no fast way to get back to that share without first clicking on the server in the Shared section of the sidebar. So how can you easily see which shares you’re currently connected to, and how can you make it easier to connect to such shares in the future? Unfortunately, there’s not one answer to that question—there’s one trick you can use to see and access currently-mounted shares, but you’ll need a separate trick to make it easier to mount shares in the future. To easily see mounted shares, first connect to any share that you may use. In the Finder, make sure you can see the mounted share—not its contents, but the top-level share—then just drag and drop it into position in the Devices section of the sidebar. In the image at left, I’ve got three mounted shares showing at the top of my Devices section. Any mounted share that's been dragged into the Devices section will always show there once you connect to the share. These entries will vanish, though, when you disconnect from the shares, so this method won't let you quickly reconnect to those shares. It is the best way I've found for quickly seeing and accessing mounted shares, however. So how can you make it simpler to connect to shares in the future, without requiring a click on the shared Mac’s entry in the Shared section of the sidebar? The best solution I’ve found is to first make an alias for each share on your local Mac’s desktop. In the Finder, click on the Shared section so you can see each share. Make sure they’re all mounted—you can’t make an alias unless the share is mounted first—then hold down Command and Option and drag each share to your Desktop (for now). After you’ve created an alias for each share you’re going to mount, create a new folder for these aliases—I named mine Mac Shares. (I’m so creative.) 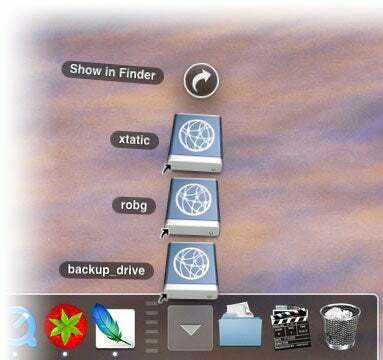 Place all the aliases into the folder, then store the folder in any accessible location. It can be dropped into the Places area of your sidebar, of course—though it’d be just as easy to use the Shared section in that case—or added to the Finder’s toolbar. Personally, though, I like to keep it in my Dock as a stack of shares to be mounted, as seen in the screenshot at left. This gives me one-click access to the shares I regularly use. Once you mount a share using the alias, its entry will then appear in the sidebar (assuming you followed the first part of this hint). In an ideal world, there’d be a simpler way to both mount and monitor shared folders, but this two-step workaround isn’t bad—and it keeps the sidebar nice and tidy until the shares are mounted.